"Յուրաքանչյուր կին ինքնին քաղաքակրթություն է։"
Պերեսն իր ողջ կյանքի ընթացքում բանաստեղծություններ և երգեր է գրել։ Նա իր առաջին երգը գրել է 8 տարեկանում, Լեհաստանում։ Նա ոգեշնչված գրում էր նույնիսկ կառավարության ժողովների ընթացքում։ Նրա բանաստեղծություններից շատերը վերածվել են երգերի, ստեղծված ալբոմները բարեգործության են ծառայել։ Նրա երգերը կատարել են բազմաթիվ երգիչներ, այդ թվում, Անդրեա Բոչելլին և Լիել Կոլետը։ Նրա վերջին "Չինական մեղեդի" երգը, որը նա գրել էր տոնելու Կապիկի տարին, ձայնագրվել է չինացի և իսրայելցի երաժիշտների կողմից մանդարին լեզվով 2016 թվականի փետրվարին։(Music Video of 'Chinese Melody' YouTube-ում). ↑ 1,0 1,1 1,2 1,3 חה"כ שמעון פרס — Knesset. ↑ 8,0 8,1 8,2 Shimon Peres, the last of Israel’s founding fathers, dies at 93 — 2016. ↑ 10,0 10,1 10,2 הנשיא וראש הממשלה לשעבר שמעון פרס הלך לעולמו בגיל 93 — Ynet. ↑ כל ממשלות ישראל — הכנסת. ↑ 12,0 12,1 12,2 12,3 12,4 12,5 כל ממשלות ישראל — הכנסת. ↑ Jim Teeple, "Shimon Peres Sworn In as Israel's President", VOA News, 15 July 2007. ↑ Joseph Telushkin. Rebbe. Page 132. HarperCollins, 2014. ↑ 43,0 43,1 Neff, Donald Warriors at Suez, pp. 162–163. ↑ Neff, Donald Warriors at Suez, pp. 234–236. ↑ Neff, Donald Warriors at Suez, p. 235. ↑ The Protocol of Sevres 1956 Anatomy of a War Plot. Users.ox.ac.uk. Retrieved 8 September 2011. ↑ Jim Teeple, "Shimon Peres Sworn In as Israel's President", VOA News, July 15, 2007. ↑ Goldberg, Jeffrey. "The Unbearable Smallness of Benjamin Netanyahu." The Atlantic. September 29, 2016. September 30, 2016. ↑ Pfeffer, Anshel. 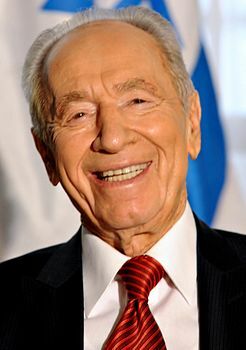 "Peres: 'Fight terror – reduce global dependence on oil'", Haaretz. May 5, 2008.